This lesson will show you how to use the search link from the schedule page. The search feature will allow you to book clients into open (available) reservations. Search for the Client or Create a New Client. Click This Package next to the package you wish to use. Note: The package will be highlighted in orange once selected. 1. Please select the desired date range to search: Enter a start and end date. 2. Please select the desired days of week: Check the boxes next to each day of the week you wish to include. 3. Please select the desired start time range: Select a start and end time. 4. Please select desired resource: Allows you to choose a specific resource to report on. 5. 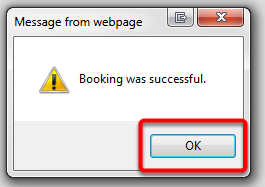 Please select the desired reservation type: Allows you to choose a specific reservation type to report on. 6. Please search for a specific session title: Enter a custom title to search. 7. Include Sessions Already Booked for This Client: This will include any session already booked for this client. 8. Include Full Sessions: This will include all sessions that are full. Once you click search your results will be listed below. 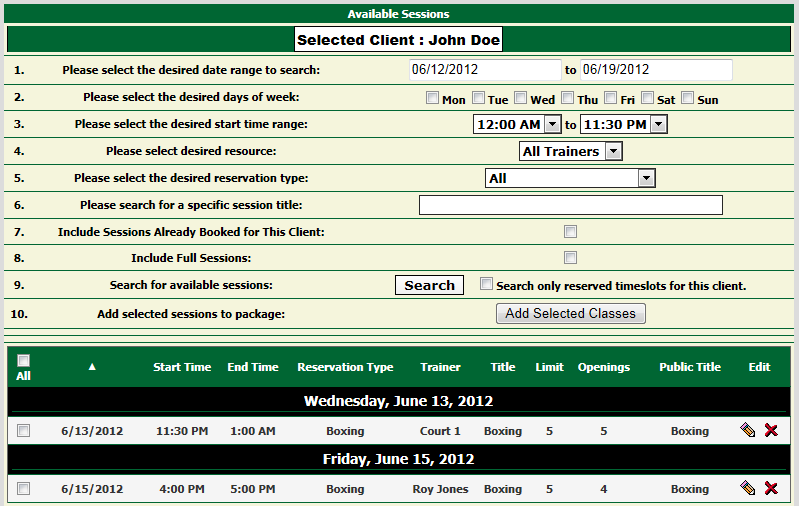 Check the boxes next to each reservation you will be booking the client into.